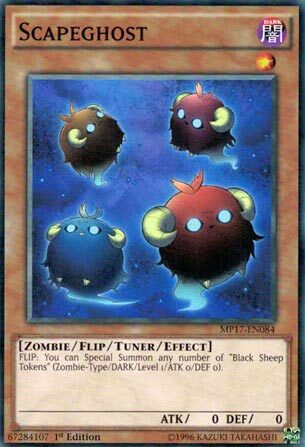 FLIP: You can Special Summon any number of “Black Sheep Tokens” (Zombie/DARK/Level 1/ATK 0/DEF 0). Scapeghost is like Scapegoat became a monster card after all its tokens met their end. Same stats as the original goat tokens, but now they are zombies. Flip effect makes it much slower than its predecessor. Same stats as the originals except their Type and Attribute switch to Zombie and DARK, which was to be expected with this card being a Zombie/DARK. You get as many tokens when you flip this monster as possible, which can make it do what Scapegoat can’t if you have too many monsters on the field, but overall Scapegoat is the much better card. While this card doesn’t lock you down summoning wise like Scapegoat does, the speed factor that makes Scapegoat great is what makes Scapeghost not. This is a 2/5 card for the number of turns it takes for Scapeghost to be useful. Otherwise it’s just a Level 1 Dark Zombie-type Tuner monster with 0 Atk and 0 Def. When it’s flipped you get to Special Summon as many clone of Scapeghost tokens as you have space on the field. Or less if you wanted. Or don’t run this because there are better Zombie Tuners. One for one increases the score slightly, but this card never really had a scapeghost of a chance with Scapegoat being legal. We got another week of random cards it seems. Randomness is always fun. We are starting this week off with a card that is inferior to the card it retrains, Scapeghost. Scapeghost is a Level 1 DARK Zombie Flip Effect Tuner monster with 0 ATK and DEF. Stats are what I’d expect on a Level 1. DARK is a good attribute to have and Zombie is a good type to have. Being a Flip Effect monster and a Tuner also gives extra benefits and opens up some plays. When Scapeghost is flipped face-up, you can summon as many Scapeghost Tokens as possible (Zombie/DARK/Level 1/ATK 0/DEF 0). The stats on the tokens are just as good as the stats on Scapeghost. This card can help you open up Link Plays, but the problem is that Flip Effects are naturally slow and Scapegoat just does this far better being a Quick-Play Spell. Sure being a Tuner means easier Needlefiber whenever that comes to the TCG, but it doesn’t make up for the fact that Scapegoat just does this in a better way. If you are playing a Flip deck, then this might be worth a 1 of, but just stick to Scapegoat otherwise. Advanced Rating: 2.5/5 Art: 3.5/5 Poor goats. This week may seem random, and it kind of is, but I picked a week of various promo cards we never looked at before. Scapeghost (the innocent, sweet Scapegoat sheep have been corrupted and now serve in alternate dimension Pac Man games!) is essentially, Scapegoat in Monster form. As you’d expect, it has 0 attack and defense, but it does benefit from being Dark and a Zombie, as well as a Tuner. Via Flip Effect, you can Special Summon as many Black Sheep Tokens as possible. For a con versus Scapegoat, you have to get this via Flip effect, so it is notably slower than a Quickplay magic card. For a pro, you can only use Scapegoat if you have the four necessary open Monster Zones. Here, you don’t have that limitation. Also, the normal Scapegoat tokens can’t be Tributed for Tribute Summon, while these can. Scapegoat (aside from Thousand Eye Restrict Morph) has more or less been player preference. If you play Scapegoat, and have this, (or can get one) try it out and see.